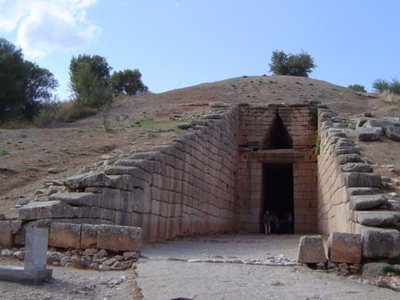 The Treasury of Atreus or Tomb of Agamemnon is an impressive "tholos" tomb on the Panagitsa Hill at Mycenae, Greece, constructed during the Bronze Age around 1250 BCE. The lintel stone above the doorway weighs 120 tons, the largest in the World. The tomb was used for an unknown period. Mentioned by Pausanias, it was still visible in 1879 when the German archeologist Heinrich Schliemann discovered the shaft graves under the 'agora' in the Acropolis at Mycenae. The tomb has probably no relationship with either Atreus or Agamemnon, as archaeologists believe that the sovereign buried there ruled at an earlier date than the two; it was named thus by Heinrich Schliemann and the name has been used ever since. The tomb perhaps held the remains of the sovereign who completed the reconstruction of the fortress or one of his successors. The grave is in the style of the other tholoi of the Mycenaean World, of which there are nine in total around the citadel of Mycenae and five more in the Argolid. However, in its monumental shape and grandeur it is one of the most impressive monuments surviving from Mycenaean Greece. 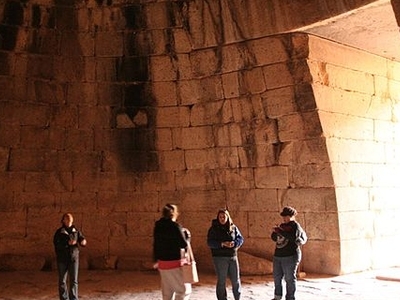 Here's the our members favorite photos of "Ruins in Corinth". Upload your photo of Treasury of Atreus! Connect with Steve Hobson, Thossa and 1 other members who are looking to visit Treasury of Atreus.